"Bringing the big screen spectacle - Brahmastra part 1 on Christmas 2019," read a tweet on Dharma Productions' official Twitter handle. OMG, this means the wait is long but our next year's Christmas gift from rumoured couple Ranbir Kapoor and Alia Bhatt will be worth it. Ranbir and Alia co-star for the first time in the Ayan Mukerji-directed film. Brahmastra, which is a three-part fantasy series, has turned out to be a really interesting project for the entire team, especially Alia, who told PTI recently: "We are very excited for the film. It is a step ahead. This will take cinema to another level. I am excited for next year." In case you didn't know, the cast of Brahmastra also includes megastar Amitabh Bachchan, south superstar Akkineni Nagarjuna and Dimple Kapadia. If that was not enough, Mouni Roy, who made her Bollywood debut with Gold, plays the antagonist. Ranbir Kapoor and Alia Bhatt spent a long period in Bulgaria earlier this year, where Brahmastra was shot extensively. They wrapped the film's Bulgaria schedule in September, after which Ranbir flew off to the US to be with father Rishi Kapoor, who is currently in the Big Apple for treatment. Ranbir and Alia resumed work on Brahmastra last week, when they were spotted exiting a dance class together. Alia and Ranbir reportedly began shooting for a song late night on Monday. 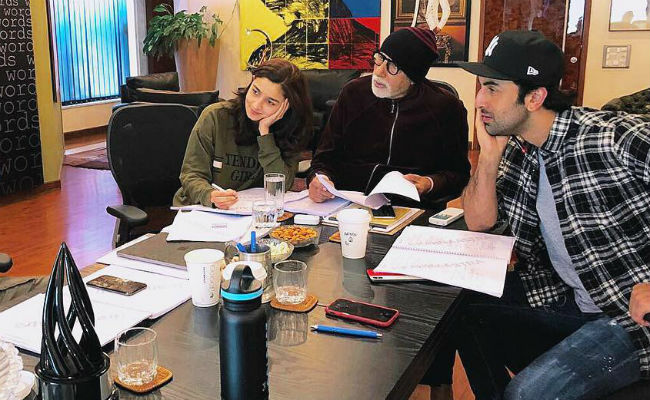 Brahmastra marks both Ranbir and Alia's first film with Amitabh Bachchan, who had earlier shared glimpses from the script reading sessions. It appears that Brahmastra will release in the same month as Ajay Devgn's Panipat and Salman Khan's Kick 2 next year.